The people who make our frozen pizzas are on strike. 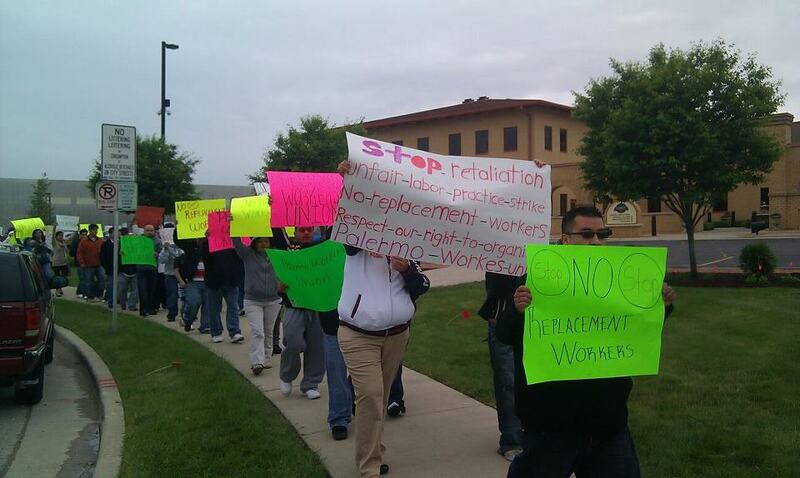 Beginning on Friday, June 1st, 2012, approximately 120 workers at Palermo's, a frozen pizza factory in Milwaukee, Wisconsin, went on strike demanding that their union, the Palermo's Workers Union, be recognized so that they can obtain higher wages and benefits. At 8 am. that morning, the Palermo's management locked the first shift workers in the factory so that they could not join their second and third shift co-workers on the picket line. Police arrived on the scene, though did not intervene to stop the lock in or press charges against the owners of the factory. As of June 4th, a picket line has been outside the factory round the clock and management has called in scabs. Palermo's is threatening to fire striking workers. In addition, management has threatened to call immigration services on the striking workers who are predominantly Latino. The local media has either completely ignored the strike or is providing false information about it. The Milwaukee Journal Sentinel – a large and generally conservative local media outlet – even claimed that “there's no action being taken against the company” and production was not effected* despite the fact that Palermos' profits have significantly decreased because of the strike, according to one striking worker and given that fact that the great majority of the workers are currently striking. The Palermo's workers are requesting solidarity in the form of boycotts and material support in the form of water, food and other resources. As part of the boycott, the workers have requested that supporters of the strike call Palermo's at (414) 643-0919 to express their solidarity with the strike and their intent to boycott the company. All information above was obtained by talking to striking workers on the picket line. As of June 7, the workers have shut down three production lines.